I'm not really a traditional jewelry type of girl. I have tons of earrings ranging in size, colors, and materials- and the same goes with my necklaces and rings. Everything has a story- whether it is where the piece was bought, who bought the piece for me, or why it was bought- and very few of them are what I would consider "simple" or "traditional." This is why I always had a hard time with simple diamond studs. Sure I think they are pretty, and I know they would go with almost everything, but to me they were always too simple and understated. And since they are almost all the exact same (besides the cut of the diamond) I could never find a pair I really liked. Until now. 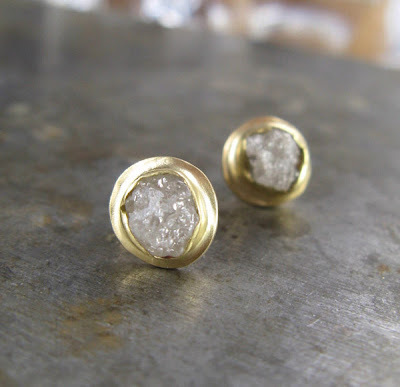 These little beauties are made from rough diamonds and I love them. They still fit the bill when you just want a "little something," but in no way are they too simple. Oh, and because they are rough diamonds, each one is a little different from the next. I think that alone is awesome. Hope everyone had a fantastic long weekend! And thanks for the birthday wishes! It was a wonderful one. Remember the Ben & Jerry's cone we were going to grab since we couldn't get a cake in time? Well my family went above and beyond on that one. My sister greeted me with one of their amazing cakes right before dinner out (the four of us polished that little piece of heaven off before the night was over) and then the next night after eating dinner with my parents, they bring out another ice cream cake! Only this one was homemade. There isn't a Ben & Jerry's where my parents are from (and since I really don't like any other places ice cream cakes) so my mom baked a cake and then searched for a pint of my favorite ice cream to spread as the middle layer. It was delicious! Thanks to everyone for such an amazing birthday and for such wonderful gifts!